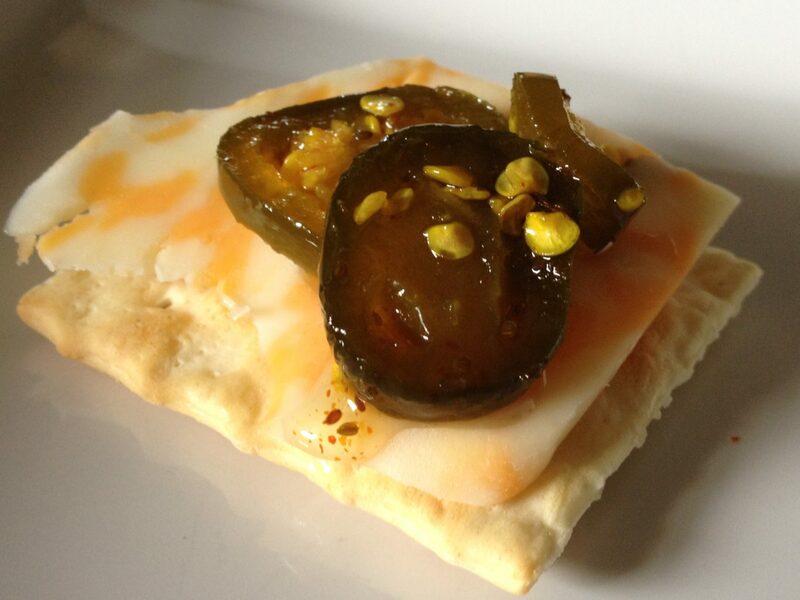 Adding candied jalapenos to a simple snack – making it unbelievably delicious! Well, last October we were introduced to a ‘new’ take on jalapenos – The Candied Jalapeno. Our friends Scott and Amy invited us out to their Fall party – and before I knew it, Jim was raving about Scott’s candied jalapenos! 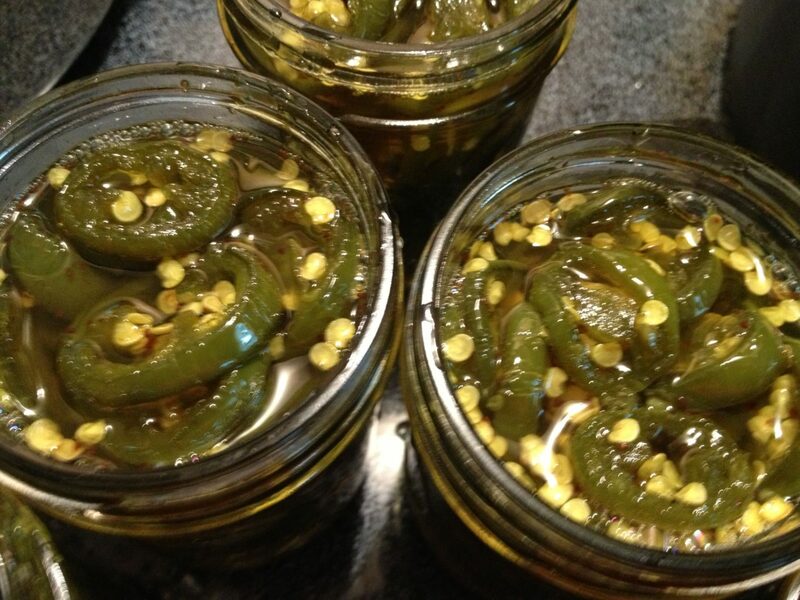 So faced with a bumper crop of jalapenos in the garden this year – my mind wandered back to that Fall party – and I reached out to Scott and Amy for the recipe. Keep in mind that these are “Candied” – and that of course entails a lot of sugar. Fortunately, you eat them in small portions or as a relish – so not huge amounts for one setting. Although – as good as these are, you might find yourself eating a whole jar in no time – they are that addicting! Maybe one of next year’s goals will to be to try to use alternative sweeteners in this recipe – but ‘Cowboy Candy” has made its way into the canning pantry. Probably not for long – Jim has discovered them! 1. *Hint – Wear gloves during this step to prevent your hands from burning the rest of the day. Remove stems from all of the jalapenos and slice into 1/8 to 1/4 inch rounds. Set aside. 2. In a large pot, bring the cider vinegar, sugar, turmeric, celery seed, garlic and cayenne pepper to a boil. Reduce heat and simmer for 5 minutes. 3. Add the pepper slices and simmer for 5 minutes. 4. Use a slotted spoon, transfer the peppers into clean sterile canning jars leaving ¼ inch at the top of the jar. 5. Turn the heat and bring the syrup to a full rolling boil. Boil for 6 minutes. Pour the syrup over the jalapeno peppers in the jars but still leaving ¼ inch from the top. Make sure there are no air pockets by sliding a plastic utensil down the inside of the jars. Wipe the rims of the jars with a clean, damp cloth and place lids on the jars. Jars filled and ready to water bathed….Do not eat for 2 weeks for best flavor! 6. To complete the canning process place the jars in a large pot of hot water, covered by 2 inches. Bring the water to a full boil and boil for 10 minutes for half pints and 15 minutes for pints. When the time is up transfer jars onto a thick towel to let cool. Leave them undisturbed for 24 hours. Check to make sure that all lids have sealed by pressing on the center of the lid. If the lid moves, place the jar in the refrigerator. All sealed jars can be stored in a cool dark place for up to a year. 7. **Hardest part** – Wait 2 weeks before you eat them — the flavors need time to meld. I know, but they are worth the wait!!! Ideas for use: Once you start eating these, you’ll find all sorts of places to sneak in this sweet, spicy, and tangy treat—sandwiches, potato salad, grilled meat, and pasta, and my favorite – as a topping to crackers and cheese, just to name a few. Thanks Scott and Amy for the recipe! Remove stems from all of the jalapenos and slice into 1/8 to 1/4 inch rounds. Set aside. *Hint – Wear gloves during this step to prevent your hands from burning the rest of the day. Turn the heat and bring the syrup to a full rolling boil. Boil for 6 minutes. Pour the syrup over the jalapeno peppers in the jars but still leaving ¼ inch from the top. Make sure there are no air pockets by sliding a plastic utensil down the inside of the jars. Wipe the rims of the jars with a clean, damp cloth and place lids on the jars. To complete the canning process place the jars in a large pot of hot water, covered by 2 inches. Bring the water to a full boil and boil for 10 minutes for half pints and 15 minutes for pints. When the time is up transfer jars onto a thick towel to let cool. Leave them undisturbed for 24 hours. Check to make sure that all lids have sealed by pressing on the center of the lid. If the lid moves, place the jar in the refrigerator. All sealed jars can be stored in a cool dark place for up to a year. Wait 2 weeks before you eat them. Once a jar is opened how long can it be kept in the refrigerator?